Efficiency, accuracy and compliance built-in. Contraqer Channel delivers the same efficiency and end-to-end visibility for your government contracting vehicles. Purpose-built for government contractors, Contraqer Channel streamlines and automates not only your workflow, but reporting as well, making government contract compliance easier, faster, and more accurate. Manage your customers, contracts, catalogs, quotes and fulfilment all in one interface. Manage your customers, contracts, catalogs, and line items all in one interface. 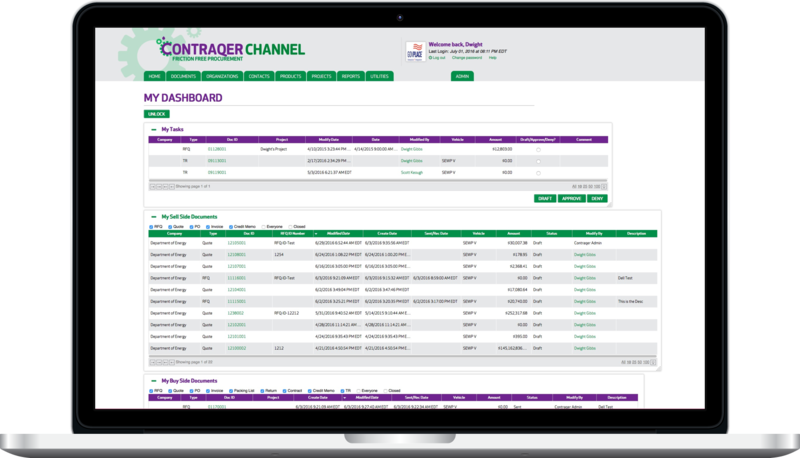 Contraqer Channel adds government contract management functionality to the core Contraqer product so you can manage and report on what you sell into government agencies as well as what you buy from your partner vendors. That means contracts and requirements, status of deliverables, your negotiated catalog, and automated reporting are all in one place. Contraqer Channel imports and scores opportunities from government sources like email and contract vehicle websites. Responding to requests is easy because your entire negotiated catalogs are already in Contraqer. With Contraqer, you can spend less time on manual entry and responses and more time discovering opportunities to grow your business. Keep Track of Requirements & Deliverables. Contraqer Channel has built in reporting tailored to government contract compliance requirements. Develop a data-driven sales strategy with internal reporting mechanisms that capture data on opportunities, bids, wins, and losses. 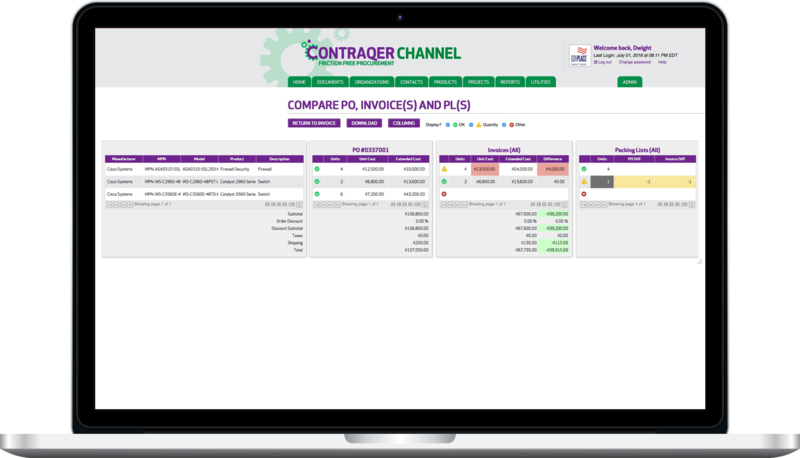 Contraqer Channel collects, centralizes, stores, and updates information on contracting vehicles and opportunities as well as your catalog, your bids, and your existing contract terms, in addition to your purchasing data. Focus your efforts on growing business, not on managing and auditing responses. Contraqer Channel is integrated, and works with other back office systems you already use, including Quickbooks, Microsoft Dynamics, SalesForce, and NetSuite. Paired with a CRM, Contraqer provides everything you need to build your federal practice and expand your contracting vehicles without adding expensive headcount. 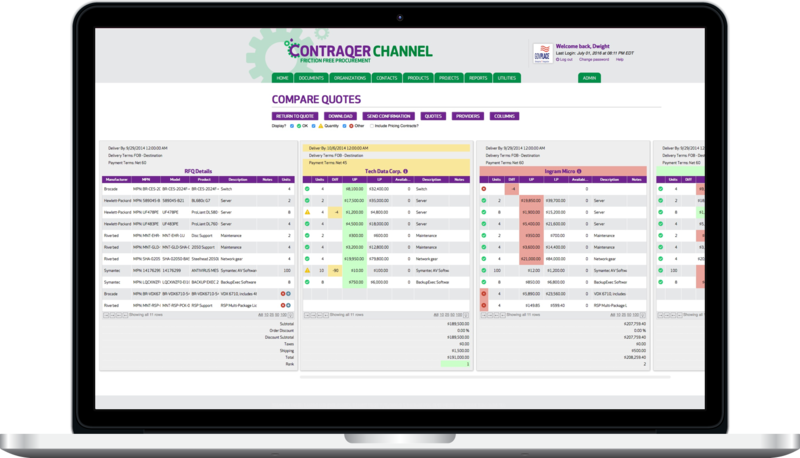 Contraqer Channel is tailored to federal contracting vehicles, and as terms and requirements change, Contraqer Channel will evolve to meet the need. Our team has worked in and around the federal government for decades – that’s how we knew we had to make a better buying tool in the first place.